Then Thames Rockets is the best speedboat to go on and experience on the River Thames. This is most certainly the best and most unique, stand-out activity in London to do and feel like James Bond. 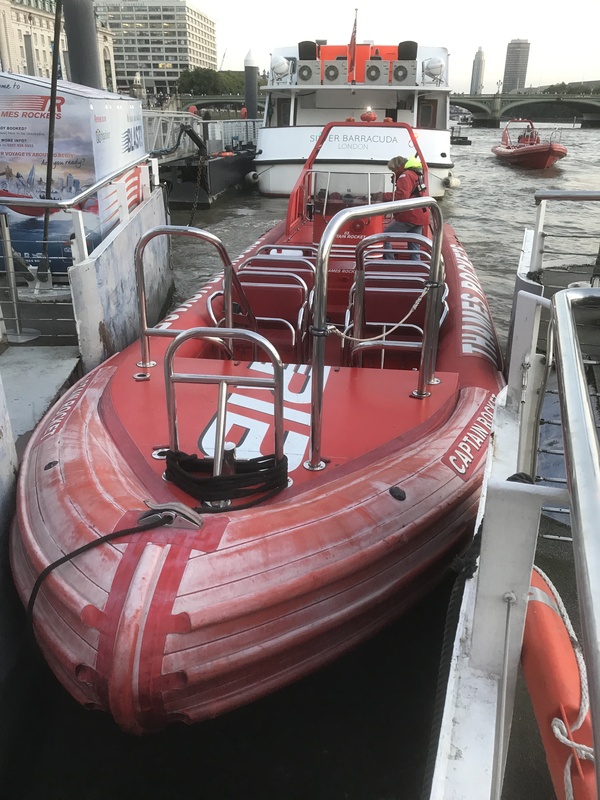 Not only will you experience speed like no other along the Thames but you will also be entertained by one of the best guides on any speedboat telling you about the many sites of London and giving you a laugh at the same time. You will see in fact over 20 iconic London landmarks and sights on your ultimate London adventure. Plus Thames Rockets has won many prestigious awards. To find out more information about their various tours click here. Wow Eat Your Heart Out 007! For fun, thrills with no spills (well the odd little splash here and there) and you feel the need for speed then this adventure MUST be on your bucket list of things to do. In the evening from 8pm it truly was amazing as the sun is setting boarding right next to the London Eye, and after you don your safety jacket with a quick health & safety talk, your adventure starts! James was our audio guide and he pointed out the landmarks with the history behind them and interesting facts (he was very funny with he’s wit and banter and without him I don’t think the trip would have been so good). The boat has to go slow past most of the famous landmarks including Big Ben, HMS Belfast, The Shard and The Tower of London until you get past Tower Bridge due to speed restrictions and water laws, then once past Tower Bridge the boat roars into action with sharp turns left and right with music blasting out of the boats speakers and the first song played was the theme to Baywatch, it really felt you were rushing to save someone in the water and all that was missing was the eye popping sight of Pamela Anderson in that classic red swim suit, plus other water related and action themes were also played including the James Bond theme!. Seeing London from a different perspective and with London’s night life kicking in this is a boat ride like no other. I truly recommend this if you are a James Bond fan or speed freak, It certainly scared ‘The Living Daylights’ out of me in places, and there certainly was ‘A View To A Kill’ that being London lit up at night. This has certainly got to be the best way in London to see the iconic famous landmarks, so forget the roads and don’t sit in the London traffic, just speed on down to Thames Rockets for the thrill of a lifetime (as you Only Live Once, NOT Twice!). Thanks to @lovepopupslondon for this great event. Never before have I felt more like James Bond than while riding on the Thames Rocket. By the time we picked up speed and were zipping through the water I was already James Bond in my mind, even before the theme tune started blasting. Being scared of boats I wasn’t sure what to expect, but I loved every second and can’t wait to go back again!! Music, speed, and a such a great laugh! Wanna perfect date night experience that will get your adrenaline running? Then look no further than here.